This is a copy of a publication in Comparative & Historical Sociology, ASA Section newsletter, 16(1):3-5, Fall 2004. Also available in pdf format. Please cite as: Deflem, Mathieu. 2004. 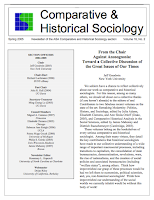 “The Ends of the State: Anarchy, Terror, and Police, 1851 to 9-11.” Comparative & Historical Sociology, ASA Section newsletter, 16(1):3-5. Sociological work on the origins of the state counts among our discipline’s best developed specialty areas, and rightly so. But our scholarly attention should also go to the evolution of the state beyond the conditions that led to the monopolization of force. In my comparative-historical work on the internationalization of social control (Deflem 2002), I build on the bureaucracy perspective of Max Weber to uncover empirically the evolving patterns and dynamics of the behavior of public police institutions. Weber himself forwarded the conception of police institutions as state bureaucracies when he specified among the functions of the modern state “the protection of personal security and public order (police)” (Weber 1922, p. 516). Weber attributed special significance to the police function by arguing that the expansion of the bureaucratization process was particularly accelerated by “the increasing need, in a society accustomed to pacification, for order and protection (‘police’) in all areas” (p. 561). From then on, Weber quipped, a steady road had led “to the current position of the policeman as the ‘representative of God on earth’” (Ibid.). The bureaucratization theory provides the basis for a sociological analysis of modern police institutions under conditions of increasing globalization from the middle of the 19th century until World War II. But the theory can also be applied to account for important dimensions of the contemporary conditions of counter-terrorism. In these variable historical contexts, the theory predicts a high degree of autonomy of police institutions to determine, on the basis of professional expertise and knowledge, the means and objectives of activities related to crime control and order maintenance. As state bureaucracies always remain related to the political power of governments, the degree of their institutional autonomy will vary and have variable implications, depending on social conditions, especially attempts by governments to politicize bureaucratic activity during periods of intense societal upheaval. Bureaucratization has theoretical implications beyond the immediate confines of social control and police, which this essay briefly explores. The bureaucratization theory maintains that public police institutions in the course of their development increasingly reveal a tendency towards independence from the governments of national states. Police bureaucracies achieve institutional autonomy on the basis of a purposive-rational logic to employ the most efficient means (professional expertise) given certain objectives that are rationalized on the basis of professional systems of knowledge (official information). The theory does not deny that police is related to state control, but holds that the behavior of police agencies is not wholly determined by reference to their relation to the political center of states. Instead, bureaucracies are shaped by organizational transformations related to a more general rationalization process affecting bureaucratic activity. In the case of social control, it is most crucial that police bureaucracies gradually adopt criminal enforcement tasks, irrespective of political directives, and develop professional techniques to fulfill these goals. In 1851, the first modern international police organization was established in the form of the Police Union of German States. Active until 1866, the Police Union brought together police of seven sovereign German-language states, including Prussia and Austria, with the express purpose of policing the political opposition of established autocratic regimes. Ironically, from such political efforts would gradually grow police organizations and practices with distinctly criminal objectives. Throughout the latter half of the 19th century, police institutions indeed developed and expanded professionally justified systems of policing and forged cooperation on the basis thereof. In 1898, a striking re-politicization attempt occurred when the Italian government organized the Anti-Anarchist Conference of Rome. Attended by government representatives of 21 European nations, the conference sought to organize an international police structure against the anarchist movement. Although a follow-up meeting was held in St. Petersburg three years after the assassination of U.S. President McKinley, independent developments in the bureaucratization of the police function prevented these political efforts from interrupting the anti-anarchist and other policing strategies which police institutions had already begun to develop beyond any political policies and international conventions. Next to the disruptive impact of World War I, another striking example of the momentary shifts brought about in bureaucratization during sudden crises occurred after the Bolshevik Revolution, when police institutions in Europe and elsewhere turned attention to the presumed spread of a global communist movement. But, once again, such politically motivated police activities would be only temporarily relevant, or they were redirected, with implications that lasted until long after World War II, in terms that did not necessarily harmonize with government power. This is most clearly revealed in the case of the FBI during the Hoover era when anti-communist police activities formed part of a generalized policing of ‘each and all,’ including the politically powerful. Efforts to politicize police institutions and other bureaucracies during moments of intense societal change are not surprising, as national crises typically bring about a centralization of power in the executive branch. What is ironic is that these politicization efforts occur progressively at times when police institutions continue to expand and solidify a position of autonomy that enables them to better resist such attempts at political control. On theoretical grounds alone, the degree to which the autonomy of state bureaucracies has been accomplished in periods of relative stability cannot be assumed to be without consequences during moments of upheaval. Historical incidents of attempts to politicize policing offer interesting parallels to the dynamics of September 11, 2001. The function and organization of police, in the United States as well as elsewhere in the world, changed significantly in response to the terrorist events of 9-11. Among the most important external determinants of counter-terrorism policing are political pressures by means of new legislations and other forms of official policy. In the decades before September 11, government policies and legislation against terrorism at the national and international level developed only slowly. Internationally, the regulation of terrorism dates back to 1937 when the League of Nations adopted a convention on the ‘Prevention and Punishment of Terrorism’. The convention found little support among the nations of the world, and, from then on, international policies on terrorism developed piecemeal, focusing on specific elements associated with terrorism (plane hijackings, bombings, hostage taking). In the United States, formal policies against terrorism also developed slowly and piecemeal until the Clinton administration secured passage of the ‘Antiterrorism and Effective Death Penalty Act’ of 1996. The political re-organization of counter-terrorism policies by the Bush Presidency has also brought about a re-alignment of military and police powers and a militarization of criminal justice in matters of terrorism. It is particularly in this context that a remarkable similarity is revealed between the current re-organizations of policing in the United States (and in other countries of the world) and the war-time reorganizations that police institutions underwent in past times. September 11 has led to vigorous attempts on the part of the governments of national states and international governing bodies to control police efforts against terrorism and, once again, take charge of police work in function of political objectives. However, because the bureaucratization of modern police institutions is now at un unparalleled high level, it makes sense to expect that police institutions will also resist politicization attempts to remain concerned with an efficiency-driven treatment and depoliticized conception of terrorism. Unlike the late 19th and early 20th century, modern police institutions have presently attained a level of bureaucratic autonomy that is unprecedented in scale and, therefore, can more effectively resist political influences in a manner that is congruent with achieved professional standards of expertise and knowledge with respect to the means and objectives of bureaucratic activity. With respect to the means of antiterrorist policing, technological advances and concerns of efficiency are observed to be the primary considerations in establishing police practices against terrorism. This technological emphasis is shown in a concern with inter-agency communications, computerized information, linguistic issues, the financing of terrorism, and the use of special investigative techniques such as wire-tapping. The emphasis on efficiency reveals the relevance of formal rationalization processes which have been observed in many modern bureaucratic institutions. In terms of the objectives of social control, the bureaucratization of policing involves most noticeably a de-politicization of the target of counter-terrorism. This criminalization of terrorism is accomplished by defining terrorism very vaguely (‘a crime against humanity’) and/or by identifying and isolating the distinctly criminal elements (bombings, killings) from terrorist incidents. As bureaucratization processes have been historically influential across Western societies (Jacoby 1969), an important implication is that cooperation among state bureaucracies policing terrorism can take place irrespective of the similarities and/or differences among nations in political, legal, cultural, and other respects. The relative independence of police thereby exposes the limitations of (monolithic) state-centered theories in terms of the specific roles played by police and other state institutions. The autonomy of state bureaucracies, ironically, creates the potential for bureaucratic activity to be planned and implemented without regard for considerations of legality, justice, and politics. Processes and structures of social control in modern states are comprised of a multitude of dimensions and institutions which are not necessarily in tune with one another. In matters of terrorism, for example, ideological and political sentiments and policies are very divided within and, particularly, across national states, while anti-terrorist strategies at the level of police bureaucracies, on a fairly broad multi-lateral scale, rest on a formal-rational conception of the means and objectives of counter-terrorism. As such, the bureaucratization of modern police institutions harmonizes with Weber’s perspective of societal rationalization as having gone in the direction of an increasing reliance on principles of efficiency in terms of a calculation of means. It is under those conditions, Weber (1922) argued, that the modern state bureaucracy becomes an “almost unbreakable formation,” while political control and democratic oversight of the bureaucracy is only possible in limited ways (p. 570). For our theorizing of the state, the important implications of these developments of bureaucratization involve the need to recognize a fundamental irony of the modern state from its origins through its further evolution. The state concentrates power, but, in developing a bureaucratic apparatus to fulfill this concentrated and growing arsenal of functions, the state’s powers are dispersed in a multitude of institutions, the organization and activities of which the state can no longer carefully control. Although there are no doubt important disciplinary techniques and strategies that have given rise to the origins of the state (Gorski 2003), the institutions that develop and multiply during the state’s continued development cannot be assumed to always be carefully disciplined by the center of the state. Not only does the evolution of the modern state bring about that the spontaneous collective attention of society is inevitably relaxed (Durkheim 1893), the functionally divided state institutions that are created in response to the weakening influence of tradition also lead to a diversification of the objectives of state power. The expansion of state bureaucracies has ironic consequences. As the state grows, the relative power of its center weakens. There is no common end to the state, of course, but neither does it suffice to enumerate its multiple functions. What is particularly important is that the many functions of the state cannot be neatly harmonized, for they each have their own instruments and institutions that develop in relative autonomy to one another and to the center of the state. A state with many means also has many ends. Gorski, Philip S. 2003. The Disciplinary Revolution: Calvinism and the Rise of the State in Early Modern Europe. Chicago: University of Chicago Press. Weber, Max. (1922) 1980. Wirtschaft und Gesellschaft: Grundriss der verstehenden Soziologie. Tübingen: J.C.B. Mohr (Paul Siebeck). English translation: Economy and Society, edited by Guenther Roth and Claus Wittich (University of California Press, 1986). See related writings on comparative-historical sociology.